Peaches and cream…baseball and hot dogs…watermelon and the Fourth of July. Some things just go together like they were made for each other (that goes for people, too). And so it is with pretzels and chocolate. You wouldn’t think such a marriage could be so magical, but one taste is all it will take to convince you that this is truly a match made in heaven! 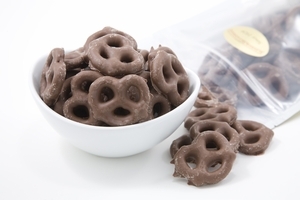 Our Chocolate Covered Pretzels combine the savory and the sweet into a taste sensation that’s impossible to pass up. On the outside: our sinfully sweet, original recipe milk or dark chocolate, so smooth and creamy-delicious. And waiting inside is a fresh, crisp-and-crunchy bow pretzel, with just the right amount of salt to offset the richness of the chocolate covering. 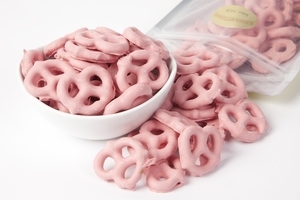 For weddings, parties or household snacks, our Specialty Pretzels give you the ideal treat. 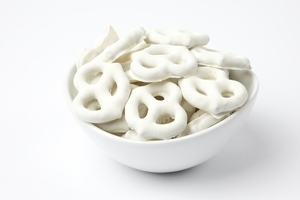 Other brides may choose traditional candies for their wedding day, but more and more, our Specialty Pretzels are taking center stage on the candy buffet. 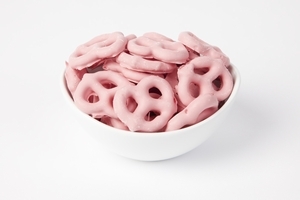 Our Yogurt Covered Pretzels, especially, have become a favored item, as you can color-coordinate for either white or pink (with our Strawberry Yogurt Pretzels) and still put out treats that are as different and engaging as you and your groom are. 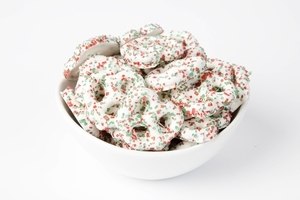 Of course, there will always be plenty of choco-cravers in attendance, so an ample supply of our luscious Milk Chocolate Covered Pretzels or intensely-flavored Dark Chocolate Covered Pretzels will fit the bill perfectly. Looking for something truly unique? 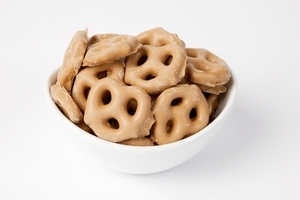 Give our Peanut Butter Pretzels a try. We’ve crafted a wonderfully rich peanut butter candy coating that you’ll have to taste to believe! (Warning: you’d better hide a few away where the others won’t find them—or they’ll be gone in no time.) 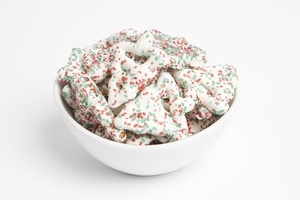 And of course, no holiday gathering would be complete that didn’t have our old-fashioned Christmas Pretzels on hand, with their decadent white chocolate coating and pretty red-and-green sugar sprinkles. 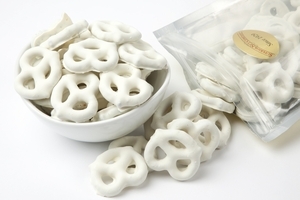 Altogether, you’ll find the fresh-and-delicious Specialty Pretzels from Superior Nut Store far superior to what’s available at the local supermarket, and a whole lot more cost-effective too. Order yours today! 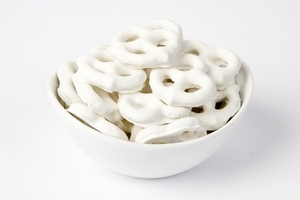 If you’re tired of your typical snack foods, try something new! 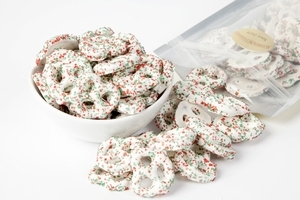 Our Specialty Pretzel assortment includes Chocolate Covered Pretzels in Milk Chocolate and Dark Chocolate, White Frosted Pretzels, Peanut Butter Pretzels and Yogurt Covered Pretzels. 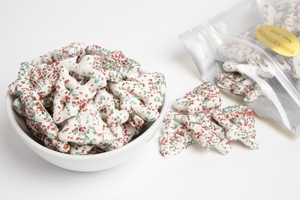 When you’re enjoying your Chocolate Pretzels, you’re eating a piece of history. Pretzels were supposedly invented by baking monks who, left with small amounts of dough, twisted them into their current shape. 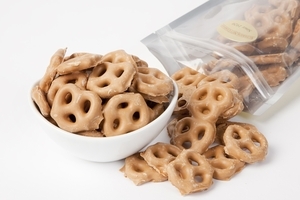 Now pretzels are one of the most widely consumed snack foods, but these aren’t your typical bar bites – they’re Gourmet Chocolate Covered Pretzels. At Superior Nut Store, we offer an extensive variety of scrumptious flavors that should be shared with your friends and families. Put them out at your next party and watch them disappear as guests savor their exquisite taste! 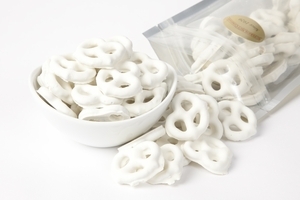 Our Specialty Pretzels come in re-sealable bags so they stay fresh and flavorful. 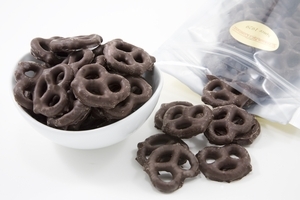 So if you’re craving a sweet AND salty snack, these Chocolate Covered Pretzels really hit the spot. Looking for more tasty snacks? Check out our other chocolate snacks and great tasting summer snacks.